In NJ? 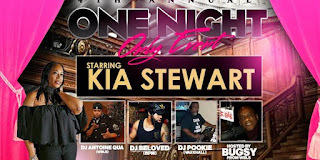 Join Kia Stewart's One Night Only! Its that time again, when we celebrate new music from Kia Stewart!! Come join us for a night of celebration, giveaways, and a wonderful show!! Djs POOKIE (vauxhall) Beloved (BPM) and Antoine Qua (WBLS)!! Its always a good time!